CARY, N.C. – From the ancient Appalachian Mountains to the primeval forests and foothills of the Piedmont region; to the beauty and mystery of the Outer Banks, North Carolina offers outdoor enthusiasts year-round adventures. Scenic rivers and crystal clear lakes provide world-class fishing and superb boating, while rugged mountains, lush forests and coastal plains offer great hunting, camping and award-winning hiking trails. The new Bass Pro Shops Sportsman’s Center in Cary, which opens Feb. 12, will outfit those who enjoy North Carolina’s natural resources in a store that perfectly reflects the Tar Heel State’s landscapes and lifestyles. The 105,000-square-foot Cary Bass Pro Shops, located at 801 Bass Pro Lane, is a tribute to North Carolina’s awesome beauty and abundant wildlife, and it offers something for everyone who enjoys the outdoors, whether it’s camping, fishing, hunting, boating, and more. It is scheduled to open Wednesday, Feb. 12, after a ribbon-cutting ceremony that begins at 6 p.m. The store’s imagery, murals, and displays reflect the region’s varying geography, wildlife and waterfowl. 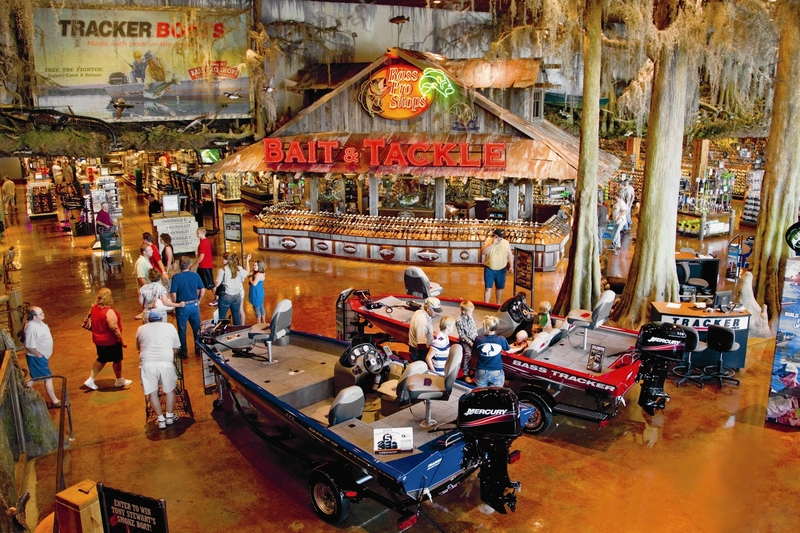 Bass Pro Shops’ uniquely designed, award-winning stores are often considered to be part museum, art gallery, antique store and aquarium, and centers for conservation education and fun. They also offer the area’s largest selection of high-quality outdoor gear as well as a staff of dedicated professionals who promote the outdoor lifestyle and live it as well. In fact, Bass Pro Shops has been voted best in delivering service excellence two years in a row by J.D. Power and Associates. Using many area artifacts, antiques, period pictures, state record wildlife mounts and memorabilia, the store becomes a living museum of the region and its hunting, fishing, camping and other outdoor legacies. Since the beginning, Bass Pro Shops’ Founder Johnny Morris has been dedicated to inspiring people, especially youth and families, to love, enjoy and conserve the great outdoors. 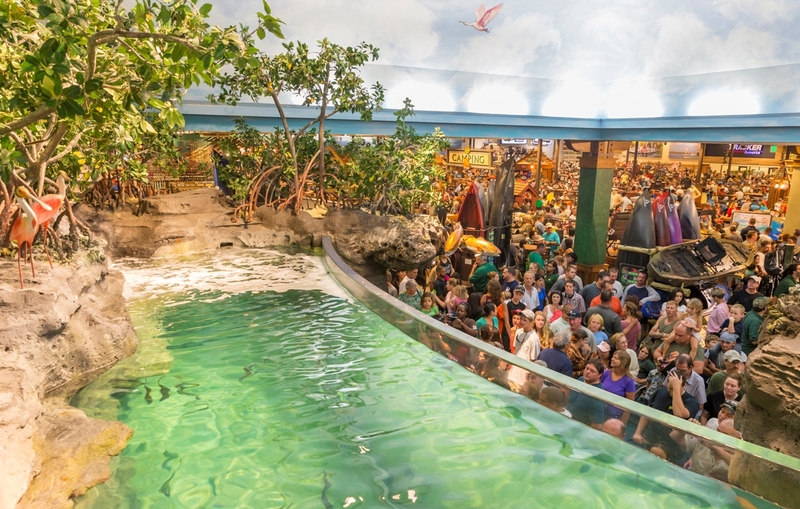 That commitment, demonstrated over the course of several decades, is a big reason why Bass Pro Shops is known as the outdoor industry’s corporate conservation leader. Bass Pro Shops’ has partnered with and supports the efforts of many conservation organizations that work to conserve and manage the nation’s natural resources. The company’s key conservation initiatives include fish and wildlife habitat improvements, conservation and outdoor skills education, improving water quality and quality of our lakes and springs, and conservation advocacy. The Conservation Partner Wall, which is located near the checkouts at the Cary Bass Pro Shops Sportsman’s Center, reflects that commitment to conservation with a display showcasing the logos of national conservation groups that Bass Pro Shops partners with. Hand-painted murals wrap the store’s interior and depict familiar scenes of the region. One gets the sense of traveling through North Carolina’s landscape as the murals transport the viewer through a series of panoramic vistas—all beautifully replicated with the stroke of an artist’s brush. Through the use of special lighting techniques, the murals take on a living, breathing quality. • In the archery department, an Appalachian mountain hardwood mural features black bear, and a bull elk and cows as a tribute to the reintroduction of elk into North Carolina. • A wall in the fishing department pays homage to the many fishing opportunities North Carolina offers—lake fishing, fly fishing a mountain stream, and coastal surf fishing. • Another mural in the hunting department shows a wooded hills vista as a backdrop for white-tailed deer and Eastern turkey mounts. • In the footwear department, a cypress swamp mural displays 3D cypress trees dripping with Spanish moss and wood ducks taking flight. • Customers are treated to a mural of the Outer Banks and its iconic Cape Hatteras lighthouse. Vintage photos and antique gear highlight the area’s original sportsmen and women. The murals are unique in the fact that what starts out many times as a simple painting extends into an actual fish or wildlife mount or some other property creating a 3D effect. The lobby features a faux fireplace constructed of reclaimed timbers and rough sawn timber skins. Shoulder mount trophies of many species grace the walls. 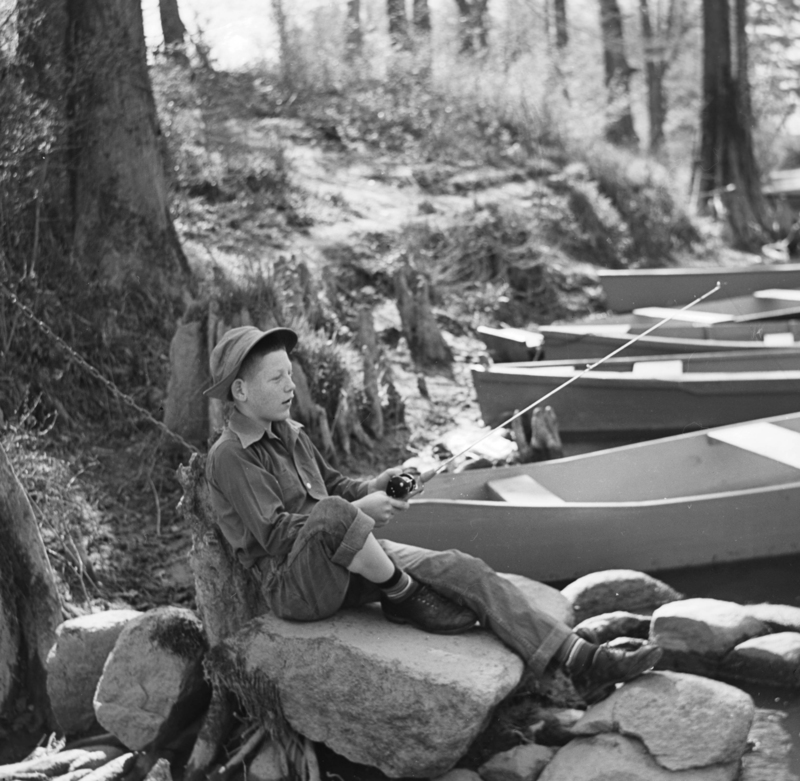 In addition, period pictures depict early North Carolinians enjoying the area’s outdoor traditions. An old General Store façade front, with walls covered with shelves of antique artifacts, creates an entrance to the gift department. The visual gives the visitor a sense of going back in time to when their grandparents shopped at their local General Store for their goods. A 16,000-gallon freshwater aquarium is a focal point of the store and will be stocked with approximately 100 fish native to the area. Native fish species include largemouth bass, white bass, sunfish, black/white crappie, channel catfish, longnose gar, bowfin and bigmouth buffalo. Museum quality wildlife exhibits and dioramas are seen throughout the store. At any moment visitors could expect to come upon a bed of resting deer, a flock of Eastern turkeys, coyotes flushing quail or wild hogs in a marsh. Area waterfowl—wood duck, mallard, Canada geese, Redhead and pintail—all are scattered throughout the exhibits and imagery of the store. Bass Pro Shops’ dedication to detail is evident wherever visitors look as artisans work to create a visual style unique to that store, including handcrafted ornate metal fire screen doors, iron railings, sconces and more. But the attention to detail doesn’t stop with store design and imagery elements. The same consideration is given to merchandise selection. Visitors will have the area’s largest array of freshwater and saltwater rods, reels and fishing accessories to choose from - all specially selected for the area. The White River Fly Shop, featuring antique and collectible fly fishing memorabilia, has a vast selection of the latest in fly fishing gear. Experts will continue the art of hand-tying flies on site and assisting customers in making the perfect selection. In the hunting department, customers will find an equally impressive array of hunting clothing and gear while the archery department offers a bow set-up shop. • Cooking accessories such as cookbooks, spices, grills, and jerky making items. A wide selection of men’s and women’s footwear and apparel, featuring popular brands including Columbia, North Face, and RedHead, are also available. Bass Pro Shops Outdoor World has hired 200 associates from the Cary area. In addition, the store will offer free outdoor skills workshops for adults, kids and families that will help maximize outdoor fun by teaching new skills and improving existing ones.